Come See The Sheepherder at the Stetson Country Christmas this Weekend! The 24th annual Stetson Country Christmas Expo is finally here, and The Sheepherder is gearing up for another great event at the Sands Expo and Convention Center in Las Vegas, Nevada, where the country’s best Western lifestyle vendors gather year after year for a full eleven days of shopping, events, activities, entertainment and more. From December 7-17, The Sheepherder (Booth #200) will join other big names in the Western gift and handicrafts industry at the Sands Expo, from 10am to 5pm daily, offering shoppers an opportunity to peruse some of the best authentic Western apparel, sheepskin garments, accessories and other goods all under one roof. The Stetson Country Christmas Western Gift Expo runs in conjunction with the Wrangler National Finals Rodeo, which sees the top names in professional rodeo compete for the World Championship in their division, and marks the official beginning of the shopping season for fans of Western apparel and home goods. 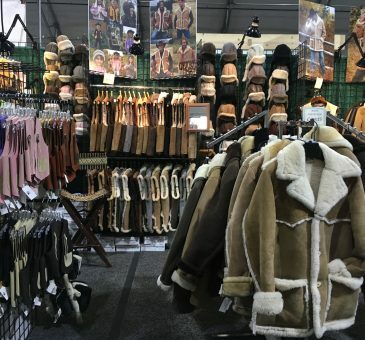 More than 400 vendors participate in the Stetson Country Christmas Expo each holiday season, and for well over a dozen years, The Sheepherder has attracted customers from all over the country to the Las Vegas convention center with its fine shearling garments and accessories. After a brief move Downtown, The Stetson Country Christmas Expo is returning to its original home at the Sands, and promises a replay of the Stetson Country Christmases of the past. In addition to handcrafted Western goods for sale, the Stetson Country Christmas event also offers live entertainment on the Ride TV Stage, fun activities for children, including the World Championship Dummy Roping for Kids, and traditional Christmas music and décor for shoppers’ enjoyment. As a convenience to shoppers, the event also has increased shuttle service to the Sands Expo, and parking and admission are both free of charge. The Stetson Country Christmas event is considered “the best and most unique Christmas shopping experience in Las Vegas,” and is also the only major shopping expo open that second Sunday, December 17, which means shoppers have an extra weekend to make sure they have everyone checked off their shopping list. From genuine sheepskin apparel to handcrafted jewelry, pottery, boots, spurs, ranch-style furniture and original art, the Stetson Country Christmas Expo is the place to shop for Western-style gifts this Christmas. If you’re a fan of Western apparel, décor or accessories, be sure to check out the Stetson Christmas Expo from December 7-17, and don’t forget to come visit The Sheepherder at Booth #200!